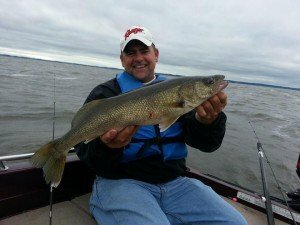 While a lot of Walleye fishing consists of deeper fishing off of points, flats and weeds, through much of the year for the next couple of months dominant Walleye patterns will occur in shallow water due to the spring spawning ritual of Walleye. As early as late ice to ice out Walleye begin to make the move to their eventual spawning grounds. On rivers, Walleye will swim as far upriver as possible until reaching dams and other river blocking structures. Once reaching these structures Walleye will find likely areas usually within a mile or two of that structure to deposit their eggs such as rocky or sandy shorelines behind current breaks. On lakes, Walleye will move up to shallow water from their deeper winter haunts depositing their eggs in likely areas such as rip rap shorelines or weedy shorelines. Remember shallow being dependent on the lake your fishing. 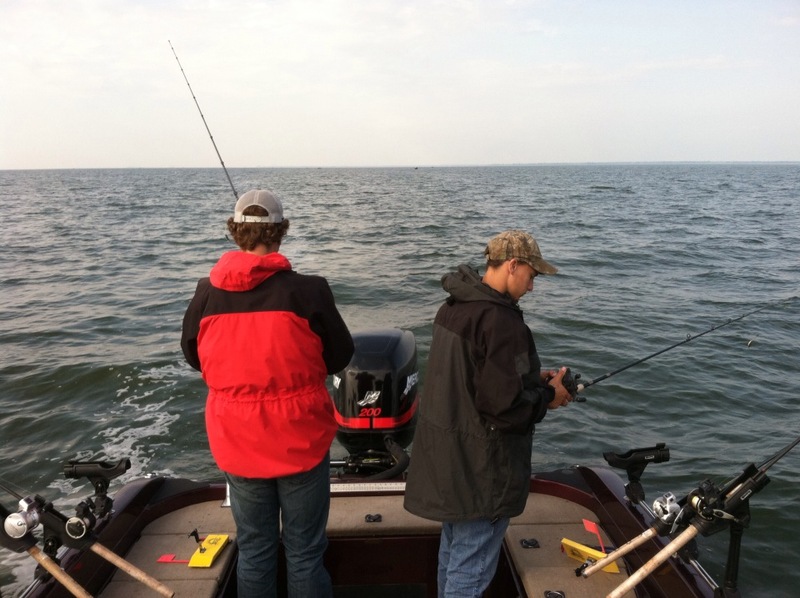 On bigger lakes, such as Erie, Walleye migrations are often very large consisting of miles of travel with Walleye depositing their eggs in the same areas year in and out much like on smaller lakes and rivers. These locations can consist of rip rap shorelines, fishing jetties, and island areas. Regardless of where you are though make no mistake that there will be Walleye shallow! But the question remains…..how does one go about catching these shallow early season Walleye? 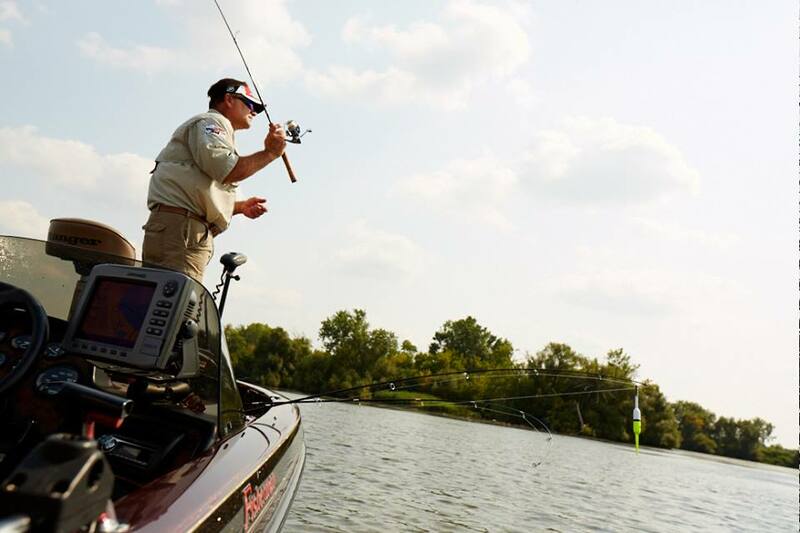 Luckily for us, the tactics we use to catch these shallow Walleye will remain consistent regardless of what type of body of water we are fishing. In early Spring during the Walleye spawn there are two presentations that I like to use to catch Walleye……Jigging and casting Stickbaits. In jigging for shallow Walleye I like to use Pline CXX Co Polymer Line #12 or Pline Spectrex Braided Line #20 in combination with Northland Fireball or traditional Round head Jigs. In many of these shallow water situations anglers will find themselves fishing around structure such as rocks or wood that can fray or break cheap lines. So this is definitely not the time to buy the $5 fishing line! In imparting action to the jig I like to use a slow hopping action, in which I simply tip the rod tip up, to get the jig off the bottom, then put the rod tip down to let the jig fall back to the bottom, reel some line in and repeat. If this action is not working I switch to a more subtle dragging action in which I slowly drag the jig across the bottom. If neither of these work it is time to start experimenting with retrieves. In casting stickbaits I prefer either of my line setups I use for jigging in combination with Storm Twitchin’ Sticks, Thunder Sticks or Rapala Husky Jerks and Original Floaters. All these lures have worked exceptionally in spring as well as year round for me. In casting these baits I prefer either a slower retrieve so that I can really sell the action of the lure to the fish or a faster retrieve to trigger a Walleye’s predatory instinct. In the first scenario, by retrieving the lure slowly most fish will find the subtle wobble of the bait to hard to pass up and strike. In the second scenario, by retrieving the bait fast this will cause a Walleye to want to chase the bait to figure out what it is, with its predatory instinct assuming it is an escaping bait fish which often times results in a strike. Regardless of what retrieve style you use when casting Stickbaits in river systems always make sure your bait flows with the current! Walleye in river systems make a living out of waiting along current seams for smaller prey fish being washed down stream for an easy meal and a lure being worked opposite to this is far from natural in appearance! Whether it be Casting Stickbaits, Jigging or some other technique that works for you, Walleye will be shallow for the next couple months through much of North America with a limit just a few.